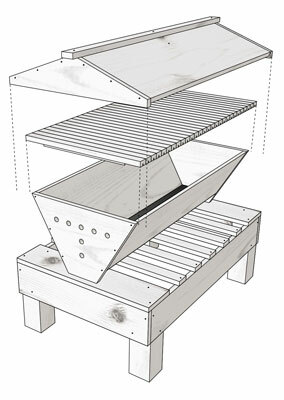 To assemble a Kenya top-bar hive, gather all your tools and components. You begin at with bottom of the hive and work your way up and up. The screws and nails will go in easier if you first drill a 7/64-inch hole in each spot you plan to place a screw. The pre-drilling also helps prevent the wood from splitting. Do this for all the components you’ll be assembling. Consider using weatherproof wood glue in addition to the screws. It helps make all the assemblies as strong as possible. Place a thin coat of glue wherever the wooden parts are joined together. Fasten the long sides into the rabbet cut of the leg posts and secure to each post using two 2-1/2 inch deck screws per post. The edge of the side rail should be flush with the post. Stagger the placement of the screws to prevent splitting the wood. Using deck screws, attach the two short sides to the leg posts and the long sides. One screw goes into the leg post, and another goes into the edge of the long side rail. Use two screws for each corner. Attach the two wide struts to the top of the stand. Position each flush with the front and rear ends of the stand. Secure each end of each strut using two deck screws. Attach the five narrow struts to the top of the stand. By eye, evenly space them between the two wide struts and secure them to the top edge of the long sides (use one deck screw at the end of each strut). Optional: Paint, varnish, or polyurethane the entire hive stand to protect it from the elements. Use two or three coats, letting each coat dry completely before adding the next coat. If you elect to paint the stand, any color will do — it’s up to you. Affix the two V-shaped end panels to the long sides using 1-3/8 inch deck screws. Use a total of six screws on each end panel. Note that the top edges of the end panels and side boards should be flush with each other. Now turn the hive body upside down and staple the hardware cloth to cover the opening that runs along the entire length of the hive body. Place one 3/8-inch staple every couple of inches. At each end of the screening, bend the screening at a 90-degree angle and staple to the end panels. Trim excess screening as necessary using tin snips. Optional: Paint the exposed exterior wood of the hive body with a good quality outdoor paint (latex or oil). This greatly extends the life of your woodenware. You can use any color you want, but a light pastel or white is best. With dark colors, the hive builds up lots of heat in the summer, and your bees spend a lot of energy cooling the hive — energy they could be spending collecting nectar. Alternatively, you can use a few protective coats of polyurethane or marine varnish on the exterior wood. You’ll assemble a total of 28 top bars. Assembly simply consists of gluing a thin strip of wood into the kerf cut groove. This is the starter strip that gives the bees a starting point to build honey comb on the top bar. For each top bar, center the starter strip into the kerf cut and glue in place using weatherproof wood glue. Let the glue dry before proceeding. Melt 1/2 pound of beeswax over low electric heat or in a double boiler. Use a disposable brush to coat the starter strips with a thin coat of beeswax. This further encourages the bees to get started making comb. Never melt beeswax using an open flame! Beeswax is highly flammable. Now place the bars into the hive body. The bars rest on the top edge of the hive body and are butted side by side, like the wooden bars of a marimba. Never paint your top bars because that could be toxic to your bees. Leave all interior parts of any hive unpainted, unvarnished, and all-natural. Affix the two inclined roof boards to the two peaked gables using 1-3/8 inch deck screws. The screws go through the peaked gables and into the edges of the roof boards. Use six evenly spaced screws per gable (see the figure for approximate placement; precise spacing isn’t critical). Note that there’s a 1-5/8-inch-wide ventilation opening at the peak of the roof. Now take the ridge rail and screw it in place using one 1-3/8 inch screw at each end. Screws go through the ridge rail and into the flat top of the gable pieces. Center the roof support wedge in the middle of the ventilation opening (underside of the roof) and secure in place with a 1-3/8 inch screw driven through the ridge rail and into the support wedge. Optional: Paint the exposed exterior wood of the roof assembly with a good quality outdoor paint (latex or oil). You can use any color you want, but a light pastel or white is best. Alternatively, you can use a few protective coats of polyurethane or marine varnish on the exterior wood. Stack all the pieces together (see the following image). Pick the spot where you want to locate your hive and place the elevated hive stand on the ground. The stand provides the bees with good ventilation, keeps the hive off the damp ground, and raises the colony so it’s much easier for you to inspect. Place the hive body centered on top of the stand. The end of the hive with the holes is the entrance, so be sure the hive is facing in the direction you intend for the bees to fly. Fill the hive body with the top bars, all 28 of them. The bees will build their beautiful comb on the underside of each top bar along the waxed starter strips. Here they’ll raise their brood and store pollen and honey. Now top everything off with the ventilated roof. It provides your bees with protection from the elements. That’s it! You’re ready for the bees!